KLINGER ball valves Ballostar KHI complies when the requirements are tightened and they already meet future standards with respect to tensile strength as well as pressure and bending load. Another feature of Ballostar ® KHI is its unique sealing system. 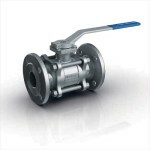 The test and drain valve welded to the ball valve housing allows temporary relief of pressure, even if the ball is closed. Ballostar® KHA is a universal solution for virtually any application.